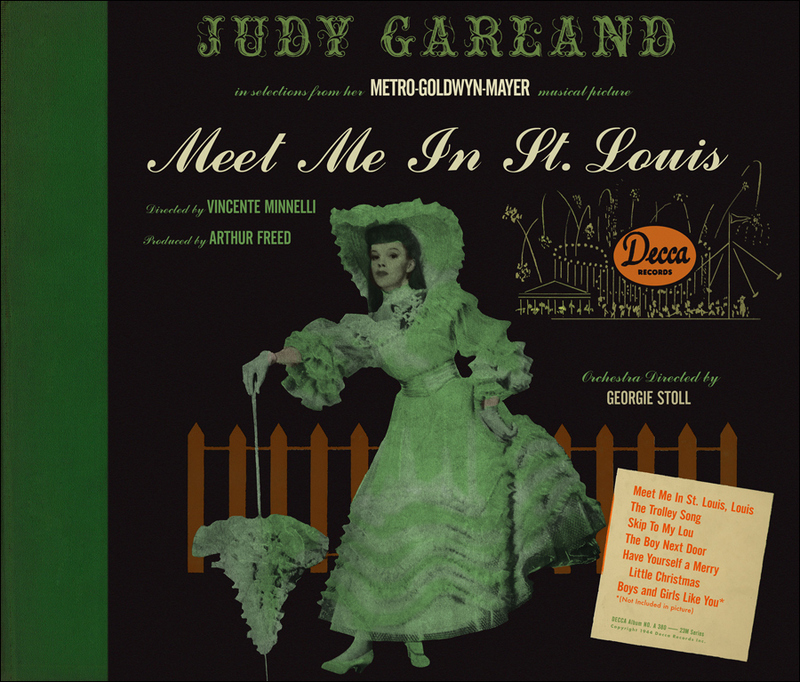 This is the second of Judy's Decca cast albums. And one of her most popular. So much so that the album reached #2 on Billboard's new "Best Selling Popular Record Albums" chart in early 1945. "The Trolley Song" would make #3 on the Singles Chart and was also nominated for the Oscar for "Best Song" of 1944. It lost to Bing Crosby's "Swinging On A Star" from Going My Way. "Boys And Girls Like You And Me" was a Rogers & Hammerstein song cut from the stage version of "Oklahoma!" prior to its opening night. 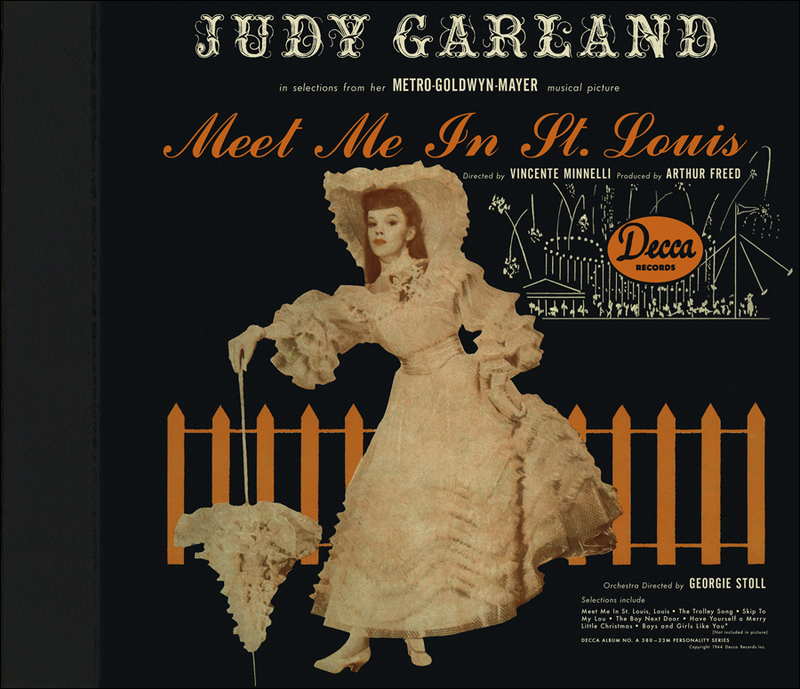 In St Louis it was planned to have Esther Smith (Judy) sing the song to John Truitt (Tom Drake) while visiting the unfinished fairgrounds, just after "The Trolley Song" sequence. The number was recorded and filmed, but removed from the picture after the first previews. The footage no longer exists. 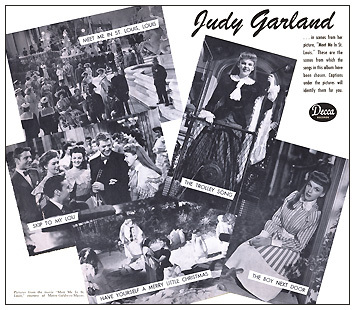 Although the song was not a part of the finished film, Judy's Decca recording remained a part of the album throughout the years. 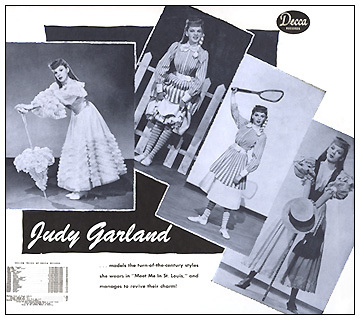 Just prior to these Decca sessions, Judy signed a new contract with the label on April 1, 1944. 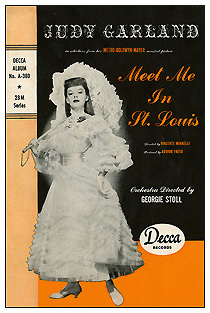 Decca released these Meet Me In St. Louis recordings on LP with The Harvey Girls in the 1950s/60s on Decca DL 8498 and then in 1978 on the MCA owned AEI label, AEI 3101. In 1996, MCA added the Girl Crazy songs and "March Of The Doagies", and released the CD version of the LP (using the LP artwork as shown above) as "The Complete Decca Original Cast Recordings" (MCAD-11491). 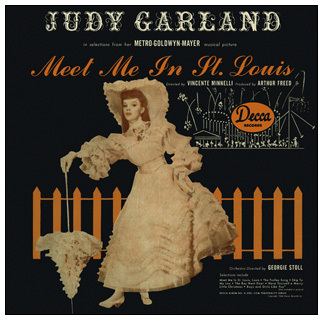 Photo above at right: Inside cover of the album features MGM publicity photos. 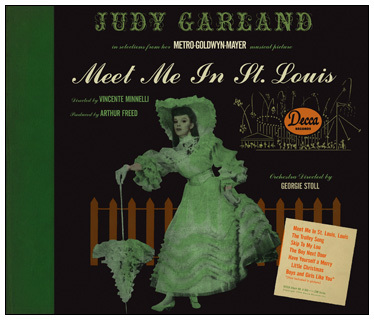 Photo at left: Cover of the insert included with the album. Click on the image to see a larger version! Album cover restoration by "Alex in Belgium". Thanks Alex! Above: Inside the back cover.